Buoyed by a triumphant 2017 launch, GulfHost - the complete hospitality equipment sourcing expo for the Middle East, Africa and Asia - returns to Dubai in October with new dedicated zones for Gelato & Bakery, Café & Bar and Horeca. Following a successful debut, international, regional and local suppliers have moved fast to secure space at the 2018 show, which caters to seemingly insatiable regional hospitality sector demand. 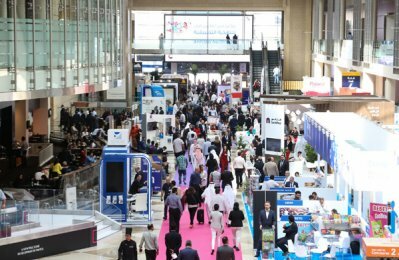 The 2018 edition, which runs at Dubai World Trade Centre (DWTC) from October 30 – November 1, will feature 2,500 brands showcasing more than 8,000 products across six core sectors and is set to draw upwards of 25,000 buyers. The spotlight this year will firmly be on the global smart kitchen appliances, with that market alone cooking at a fast pace and expected to reach $4.8 billion by 2025, growing at a compound annual growth rate of 27.4 per cent, according to Invant Research report. This soaring demand is directly linked to the desire to boost efficiency, production and waste reduction amongst key hospitality players in an increasingly competitive landscape. With technology playing an ever-growing role in the hospitality sector, the latest innovations will be at the forefront of GulfHost 2018 with the spotlight firmly on emerging technologies that promise to offer even more benefits for the back-of-house operations. Bringing the best quality standards of Italian-made products is Italy-based Emainox, which specialises in the production of food service equipment. Emainox will showcase its revolutionary range of Heko smart kitchens, where each model is bespoke - tailored to the customers’ needs. “The Middle East hospitality sector is constantly growing and so is the food equipment industry. We strongly believe that GulfHost is a good showcase to present our products, ranging from food service equipment, professional washing and water treatment systems to smart kitchen units. We are able to respond and satisfy different customer’s needs supporting them throughout the project, from the concept to the installation. GulfHost is a great opportunity for our company to confirm our presence in this market, strengthening the existing relationships with local partners as well as creating new ones.” said Luca Locatelli, director and owner of Emainox. With the GCC hospitality market expected to reach $36.7 billion by 2020, according to a Euromonitor International report, growth is being driven by several key factors, including increasing disposable income, surging tourism and the continued rise of ‘dining out’ culture across the region – from fast and casual to fine. To meet the complete industry needs in the UAE and the GCC region, UAE-based exhibitor Falcon Professional Kitchen, the leading professional kitchen manufacturer and supplier, offering turnkey kitchen solutions, will bring its bespoke space that saves on cooking and prep units. The Carpigiani 161G unit serves the purpose of serving high-quality ice cream in a confined space. In addition, Falcon Kitchen’s Out-of-Home Specialty coffee solution, a customised cold brew solution unit will be displayed at GulfHost as a part of a growing trend of cold brew coffee solution in the F&B market. This will give potential partners insight into what the company can offer in different fabricated customised cold brew unit solutions. Running alongside GulfHost will be DWTC’s trio of tightly-targeted food product trade shows: The Speciality Food Festival, yummex Middle East and Seafex Middle East. Show floor opportunities will be augmented by a full schedule of onsite features and training initiatives supported by major culinary associations. A focal point will be the GulfHost Restaurant Development Conference, powered by the International Centre for Culinary Arts in Dubai and the Middle East Food Forum - an open-door, transformative learning platform hosted by the shining stars of regional F&B. Over the three days, more than 60 high-profile speakers will take to the floor to share proven methods for navigating the latest foodservice shifts, offering a valuable opportunity for local and regional professionals to gain insights that will keep them abreast, if not ahead, of dynamic industry changes. Another major draw will be the ICCA World Chefs Education Theatre hosted in partnership with the World Association of Chefs Societies. This onsite workspace will serve up certified training to executive chefs seeking next-level culinary development. Utilising custom-built, cutting-edge kitchen technology on the theatre floor, participants will be guided through workshops covering food preparation techniques and trends, ingredient cost management, food waste reduction and productivity output. The comprehensive agenda also includes the National Barista & Latte Art Championship; the second GulfHost Innovation Awards, which will recognise progressive technologies shaping the future of hospitality equipment solutions across the Mena region; and the GulfHost Gelato Campus, which is gearing up to turn competitive gelato creation into an immersive, multisensory show experience.